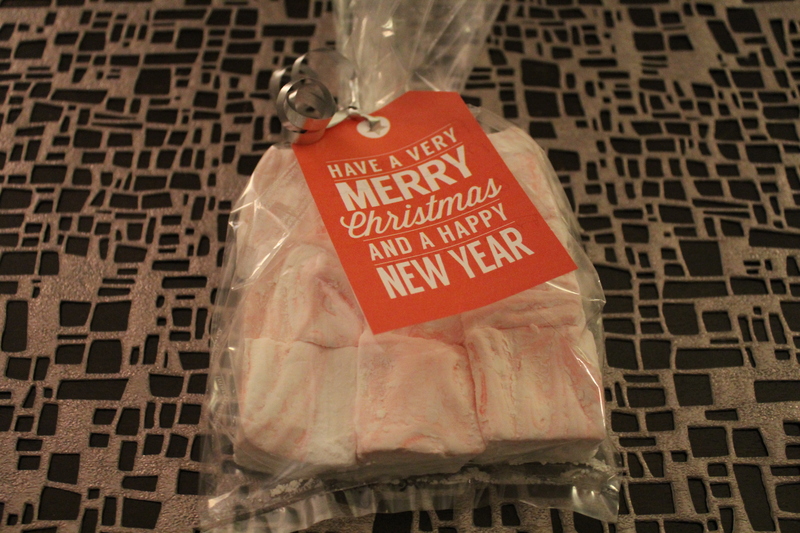 Sunday afternoon, I made some peppermint marshmallows to give some of my co-workers. (The printable gift tags I used can be found here). Though I’ve had the idea for a while, I waited to make them as close to when I planned to give them away as possible. I’ve made marshmallows before, but the recipe I used this time seemed both easier and less messy than the last time. I’ll be saving this recipe to use again. The key is making sure the pan is completely coated in the powdered sugar-cornstarch mixture. Then, as each marshmallow was individually cut, dip each cut side into the mixture as soon as possible. It will make the marshmallows easy to handle. Otherwise, they’ll stick to your hands. Next time, I’d add more than just 4-5 drops of food coloring too. I tried getting the red to cover as much of the marshmallows as possible, but all that did was fade the color to a light pink and lose more of the swirl pattern to more of just an all over pink color. These marshmallows deliciously melt into hot chocolate and taste oh so much better than the kind that come from a store-bought bag. I highly recommend making some today to enjoy tomorrow and Christmas Day.